Toyota's best-selling luxury van returns with sharper styling and an improved ride. How will it appeal to the family man or the towkay? Authorised Distributor Toyota cars are Toyota C-HR, Toyota Camry, Toyota Corolla Altis, Toyota Fortuner, Toyota Harrier, Toyota Previa, Toyota Prius C Hybrid, Toyota Prius Hybrid, Toyota Prius+ Hybrid, Toyota RAV4, Toyota Sienta, Toyota Vellfire, Toyota Vios. 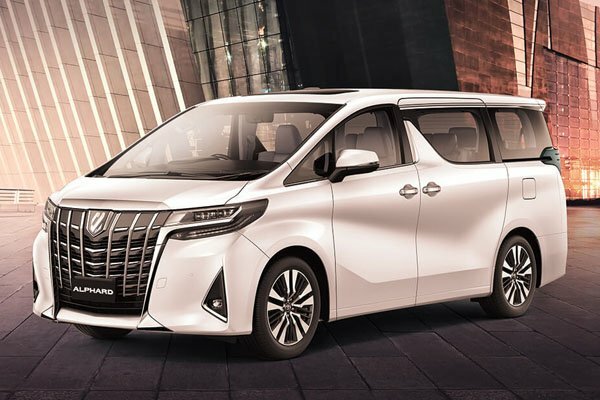 Parallel Imported Toyota cars are Toyota Alphard, Toyota C-HR, Toyota C-HR Hybrid, Toyota Camry Hybrid, Toyota Corolla Axio Hybrid, Toyota Dyna 150, Toyota Esquire, Toyota Esquire Hybrid, Toyota Estima, Toyota Estima Hybrid, Toyota Harrier, Toyota Hiace, Toyota Hiace High Roof, Toyota Hiace Mid Roof, Toyota Hiace Standard Roof, Toyota Hilux, Toyota Hilux Double Cab, Toyota Land Cruiser, Toyota Land Cruiser Prado, Toyota Land Cruiser Prado Diesel, Toyota Land Cruiser Utility Commercial, Toyota Liteace, Toyota Noah, Toyota Noah Hybrid, Toyota Prius Alpha Hybrid, Toyota Prius Hybrid, Toyota ProAce, Toyota Sienta, Toyota Sienta Hybrid, Toyota Tank, Toyota Vellfire, Toyota Vellfire Hybrid, Toyota Voxy Hybrid, Toyota Voxy Welcab, Toyota Wish.